Youth all over the state are working to make their school or neighborhood a safe, active and healthier place. Are you working to improve your school lunch? Creating safer parks? Educating your family or community about eating healthy and being more active? Show us how! Starting on Monday, Dec 10th, send a photo and brief description on our facebook contest app showing us what YOU are doing each day to improve the health of your school or neighborhood. There will be 1 daily winner each day for 12 days ($100 cash gift card) and each photo submitted will count as a entry for the Grand Prize: an iPAD Mini and a $500 cash gift card for a nonprofit organization of your choice! 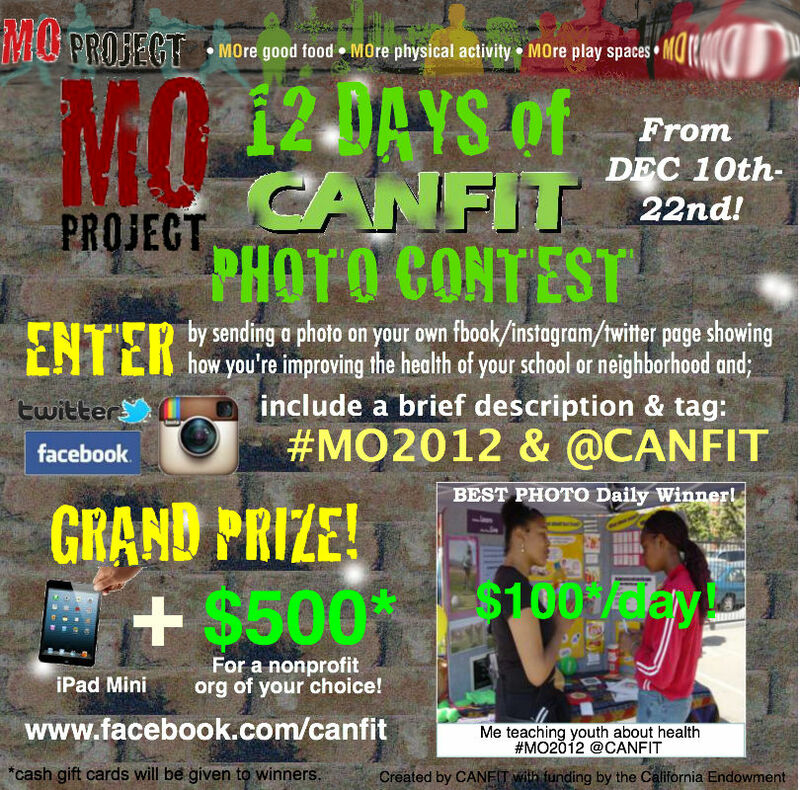 You can also enter by sending a photo on your own Twitter or Instagram account using the tags #MO2012 and @CANFIT. Working in a community garden/farmer’s market, making your park more safer, educating about a local/state policy, presenting at a city council meeting, starting a walking club, etc. You can also take a photo of something you would change in your school or neighborhood to make it a safe, active and/or healthier place. We want MO’ physical activity in school, bike lanes, programs for youth, eliminate junk food advertising, serve healthier food in schools, liquor stores, etc.